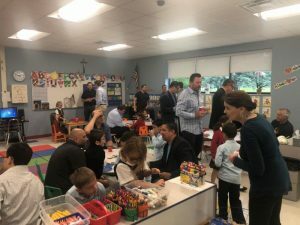 Kindergarten Readiness I was amazed this morning to see a representative from 100% of our families attend Doughnuts with Dad in our Kindergarten Readiness this morning. The students and their dads had a great time. It was a nice way to celebrate our last week of school. We are so lucky to have such a wonderful group of dads here at St. Hugo! Field Day Tomorrow A reminder that Field Day is tomorrow. I am very grateful to our many parent volunteers that have signed up to help make the day special for our students! It should be a fun day, with lots of exciting games and activities planned for all ages. Hot dogs will be grilled and served outside for lunch tomorrow. Please be sure that your child wears their field day T-shirts with the appropriate shoes and clothing for tomorrow, and also that you have signed a permission slip for your child to participate. Thank you: A very special, heartfelt Thank You to all of the parents who have donated their time, talents and treasure to our school this year. It has been a wonderful school year, and we are grateful as we think about how our children have grown spiritually, academically and physically at St. Hugo of the Hills School. Many thanks to our PTG Committee Colleen and Mike O’Brien-President, Lorry and John Schwegman-President-Elect, Laura and Tim Kalil-Treasurer, Jodi and Joe Carrol-Treasurer-Elect, Cindy and John Hermann-Secretary, Erin and Mike Marsh-Parent Liason and teachers Megan Fleischer and Meghan Carter. It was a wonderful PTG to work with! Thank you to the following parents who tirelessly volunteered as Room Parents: Stacey Tuohy, Janet Rivard, Debbie Klein, Jennifer Nykerk, Tammy Alberts, Nikki New, Natalie Guerra, Kati Becker, Laurie MacMichael, Carol Spender, Kelly Monahan, Katie Gieselman, Gilda Wachowiak, Janelle Ciarlone, Stephanie Hannan, Allison Mayette, Ann Lazar, Sonia Vittiglio, Elisa Palizzi, Colleen Ferrrara, Tressa Joseph, Karen Wieczorek, Rana Jazrawi, Melissa Williams, Deanne Seifert, Megan Kindt, Patty Wyciscalla, Carrie Jesena, Ginna Segura, Tracey Jacob, Jacquie Bluethmann, Nicole Orow, Hope Adamski, Reena Herstein, Rebecca Rudnick, Andrea Brzustewicz, Stephanie Schwartz, Barb Bojan, Carolyn Still-Love, Shavon Manni, Gina Thomas, Arlene Curioca, Julie Cardillo, Rachel Smidt, Carli Vaupel, Katie Wybo, Michelle Abdou, Ann Connolly, Marlene Ibrihim, Laura Sabagh, Lauren Oriani, Courtney Clark, Suzanna Cerroni, Laura Del Pup, Nicole Orow, Elizabeth Bedia, Cheryl Van Drie, Tracy Rojas, Christina Ayar, Kelly Thalmann, Sandy Orow, Reta Shammami, Grace Sesi and Julie Gheen. We would also like to wish the very best next year to Heather Koziarz and Erica Thurman as the 2018-2019 Head Room Parents and Thank You for the amazing job done this year by Yasmine Najor and Julie Torok! Mrs. Carolin: Mrs. Carolin will not be returning to second grade next school year. She will be taking on a part-time resource teacher role. Thank you to Mrs. Carolin for her years of service in second grade and we look forward to her new role. Kindergarten Readiness – For Father’s day, the Kindergarten Readiness celebrated Donuts with Dads day.